Sometimes when driving off the lot a car is not 100% the way you want it. There may be a missing style, something off. That’s okay, we at Savannah Toyota have a style solution that drivers in Georgia will love. Window tint, not only does window tint make your car, truck, or SUV look better, it has practical benefits as well. Window tint will block 99% of UV rays, therefore, keeping you cooler during the hot Savannah summers. Window tint is a great gift idea for the driver looking for something more for their car. Whether it’s Christmas, a birthday, or you just want to surprise the car lover in your family, window tint can be a great surprise! 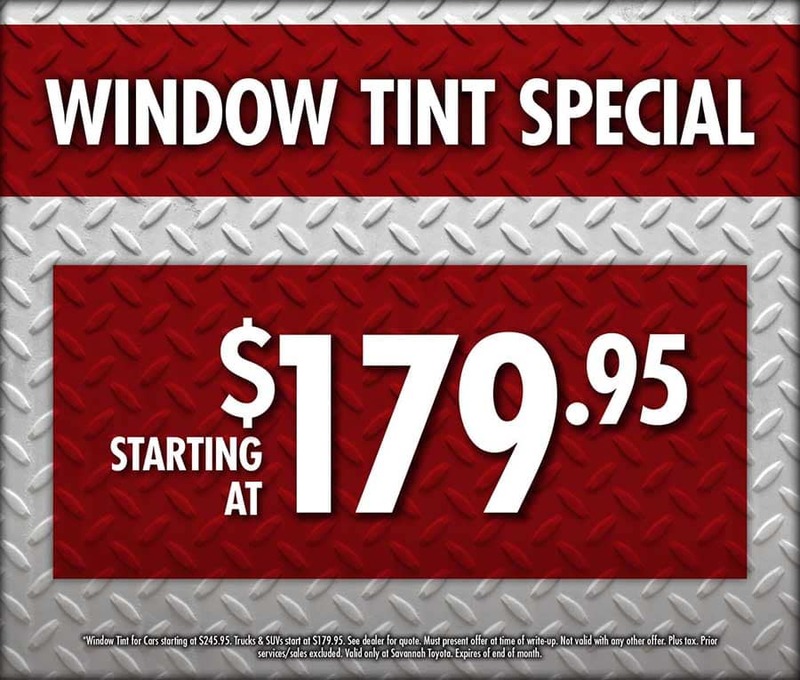 Our window tint for cars starts at $245.95 and trucks and SUVs from $179.95. Call (912) 927-1234 for more details and to schedule an appointment. Some may think that window tint is purely for style reasons. That is not necessarily true, window tint can provide many practical benefits while adding a style element. Can Help Global Warming – by helping keep your car cooler you may not need to use air conditioning as much. This means you use less gasoline during the summer. General Comfort – some cars with darker interior can get hot during the summer. Window tint can help keep the car roughly 60% cooler during the hottest months. Sun Burn – because our window tint blocks 99% of UV rays, you can prevent any potential sunburn from getting your windows tinted. More Privacy – when you pull next to another driver at a stoplight sometimes you can’t help but make awkward eye contact. With a window tint, you’re less likely to make that eye contact. Savannah Toyota has a great selection of new and used vehicles that would look and feel great with a window tint treatment. Our service department is fully staffed with factory trained experts who know how to give your car the treatment it deserves. Contact Savannah Toyota today to get more information about window tint in Savannah today!